“Every person who got a deal on Dragon’s Den, without exception, was able to articulate their business idea in 90 seconds or less.” Kevin O’Leary, Dragons Den on CBC, Shark Tank on ABC. 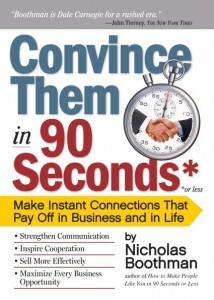 To illustrate what Kevin means here’s an excerpt from page 251 of Convince Them in 90 Seconds. It was the late 60’s and I was having lunch with Francis Xavier Muldoon, my mentor, in The Nag’s Head pub in Covent Garden, London. We’d just made a successful presentation to a room full of media-buyers. Muldoon was delivering some of his magic. The waitress arrived balancing the food. The fish and chips were golden and crispy. The shish-kebabs came with mash and onions–the pub grub touch. “All great communication comes down to a few catchy emotional words. They should hit four hot-buttons in 90 seconds or less.” He tapped his fingers on the table as he reeled them off. “Attention, Interest, Desire and Action. A great presentation is kind of like this shish-kebab. It’s a fast pitch with a hook, a point, some steak and some sizzle, and it has ‘legs.’ When I say legs, I mean it has word of mouth magic.” He sipped his claret and paused. “By presentation I mean anything you do to convince others to take action.” He picked up his fork. “The hook get’s their attention like a TV headline. There’s your A.” He dinged his fork against the metal hook on the kebab. The point tells them why they should be interested. What’s in it for them. That’s your I.” Ding. “Interest. The steak is the logical stuff–the facts and figures to back up your point so you make sense. The sizzle is the fun stuff — the emotional, memorable satisfying part to blend their reason and imagination together and tweak their desire. That’s D.” Ding again. It’s a simple formula and it works whether you’re selling real estate, designing concept cars, looking for the perfect partner, advertising your college, promoting your team or pitching your idea on Dragons’ Den. And you can learn how to serve up your own business shish-kebabs on pages 252-3 of Convince Them.